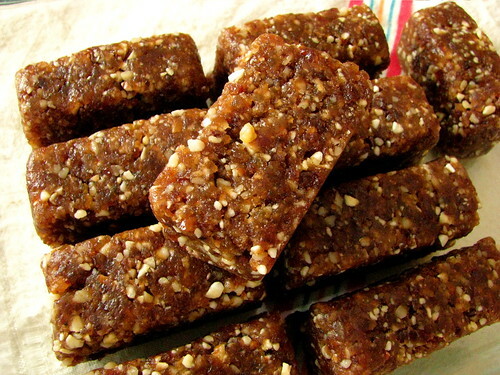 raw vegan bars, originally uploaded by Rcakewalk. When I got a friendly email last week mentioning raw vegan recipes, I realized that while I've made quite a few vegan things, I was really pretty clueless about raw vegan "cooking". I do come across many delectable looking raw vegan recipes, especially when I'm specifically looking for them, and decided that I am going to challenge myself to a month of Mondays of raw vegan recipes. My clarifier here, is that it may not be a whole meal or something that I can convince my Husband (or that picky picky Boy-O) to eat, but it will be something that I eat, and hopefully will love. It may seem that I started out pretty easy for week one: these fruit and nut bars from That Vegan Blog. But we are in Wisconsin, the state that may have invented the "Bar". Until I had friends visiting once from the East Coast, I never really knew that the rest of the country didn't make a big deal out of bars. It is a Midwestern privilege, and it's really a shame more states don't follow our lead since there are so many good ones out there worthy of bragging over. These were everything they promised to be, and got me out of my Fudge Baby rut. The inclusion of raisins actually tempers the extreme sweetness of the dates, and makes these nearly irresistible. So there you go! Now my brain is properly reset for the Raw Vegan experience, I hope to find some killer things to experiment with before next Monday. See you then!